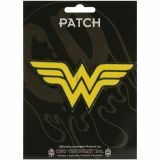 DC Comics Patch - C&D VISIONARY: Iron-On Applique Patch. These fun super-hero patches can be applied to almost any fabric by sewing, using permanent fabric glue, or by heat setting with an iron. Each package contains one patch and a wide variety of designs are available (each sold separately). Exact size varies by design but each is approximately 3 to 4 inches. Imported.